Introduction: Gena Philibert-Ortega is a genealogist and author of the book “From the Family Kitchen.” In this blog article, Gena shows how newspaper articles can fill in the details only hinted at in some records, such as morgue documents. What records have you used to verify your ancestor’s demise? Normally, death certificates and obituaries are the family historian’s go-to source for researching death, but there are other documents available as well. An example of a unique set of records is the Hamilton County, Ohio, Morgue Records, 1887-1930, available from the University of Cincinnati Libraries Digital Collections. This is but one example of the genealogically significant records available through academic digital collections. A record set such as this is a rich source of genealogical information. But the information it provides only goes so far – we don’t really learn the full story of how or why the deceased died. To learn that story – or any of the stories about our ancestors’ lives – we need a collection of old newspapers such as GenealogyBank’s Historical Newspaper Archives. Filling in the story hinted at by a morgue record is a good example of the importance of enhancing what you find in one set of records with newspaper articles. Newspapers are a perfect companion to most records. Once you find an ancestor in a morgue document, search the newspapers and verify names, dates, places, and additional details to learn the full story. In this blog article, we’ll look at three examples that show how newspapers enhance the story of an ancestor’s death after first finding them in a morgue record. In the case of deaths that are anything but natural, it’s important to follow the paper trail found in old newspapers. Murders, suicides and accidents can mean numerous newspaper articles on the day of and following the event – and sometimes, preceding the event. 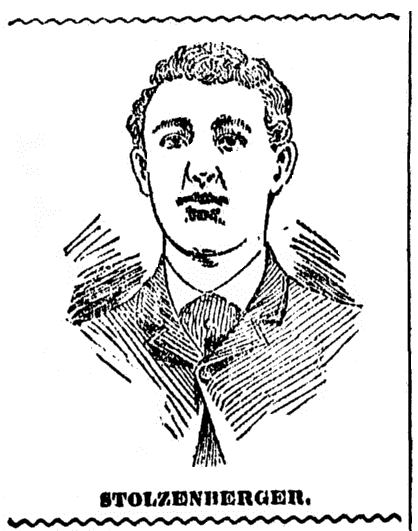 One such example begins with the 1895 Hamilton County morgue record of Louis Stolzenberger. In that record we learn of his death – then, in a series of newspaper articles detailing his crimes and their aftermath, we learn more about the circumstances surrounding Stolzenberger’s death. Louis, distraught over the death of his child, began his crime spree by physically abusing his wife. After the abuse was reported to the police, Officer Morris went to the Stolzenberger home to serve Louis with a warrant. Initially, Stolzenberger appeared to cooperate by proclaiming “all right” – but then he took his pistol, placed it at the officer’s chest, and fired. As Stolzenberger fled the scene he saw his sister-in-law, Minnie Cook, and fired two shots at her but missed. Another officer, Fred Shafer, gave chase and, as expected, Stolzenberger then started firing at him. Officer Shafer returned fire, hitting Louis in the neck. 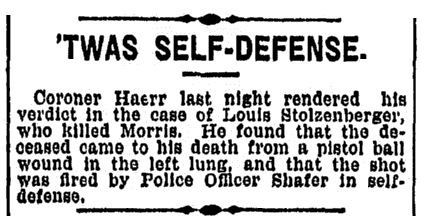 One newspaper article reports that Louis’ “…body was taken to the Morgue.” Stolzenberger is said to have been “… jealous of his wife, and accused her of infidelity.” But this article doesn’t stop there: it goes on to tell the story of Officer Morris’ last moments, including dictating his last will and testament (great news for his descendants). This article includes a pencil sketch of the accused, Louis Stolzenberger. As this newspaper article reports, a coroner’s inquest ruled that Officer Shafer was acting in self-defense in the death of Stolzenberger. Genealogy Tip: This event is a good example of why you want to make sure you don’t narrow your geographic search for an ancestor too much. When I searched on “Louis Stolzenberger” in just Ohio newspapers, I came across a few articles. But when I tried the same search and didn’t specify a place, I received hits for articles in newspapers from Indiana, Michigan and Nebraska. It is a safe assumption that an event like this would be picked up by other newspapers. Remember that a newsworthy event may be reported by newspapers across the country. 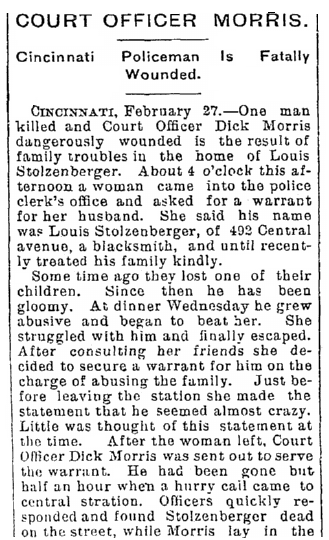 Further genealogical research into city directories finds Lizzie Stolzenberger, the widow of Louis, living in Cincinnati after his death. If we were to continue our research on the Stolzenberger family it would include tracing their lives in Cincinnati using city directories, the U.S. census, vital records – and, of course, newspaper articles. One of the aspects I love about genealogy is that research is always full of surprises. We want to believe that our ancestors lived predictable, neat lives, but life is messy. One of the records in the Hamilton County Morgue collection is for George Montgomery. His date of entry is 24 May 1892, but the notes mention that he most likely died the previous month from a suicide. Wanting to know more of the story, I turned to the old newspapers. A newspaper search tells us of the events leading up to the morgue entry. 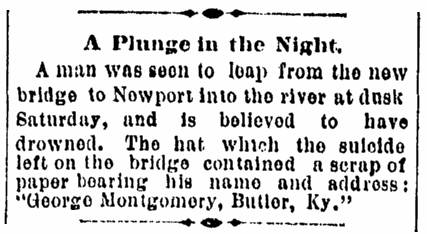 First, a short mention is found in an April newspaper article that reports a man was seen jumping from the Newport Bridge, leaving behind his hat. 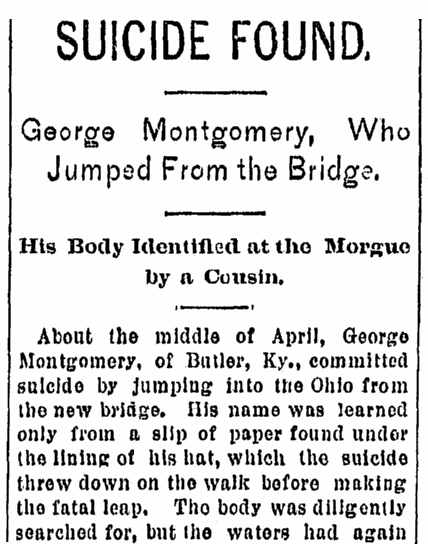 About the middle of April, George Montgomery, of Butler, Ky., committed suicide by jumping into the Ohio from the new bridge. His name was learned only from a slip of paper found under the lining of his hat, which the suicide threw down on the walk before making the fatal leap. His cousin, Dr. I. J. Bonar, identified the remains. The article goes on to report that Montgomery was a single, 40-year-old man with a previous suicide attempt. Genealogy Tip: It’s important to widen your search to the days, even weeks, prior to a death reported in a morgue record. Earlier newspaper articles may report everything from a sickness to, in this case, the events leading up to finding a body. While narrowing your search is important in cases when you are trying to find someone with a common name, it is imperative to try several different searches and to expect the unexpected. There’s no doubt that life was dangerous for our ancestors. This can easily be confirmed by reports of occupational-related deaths. 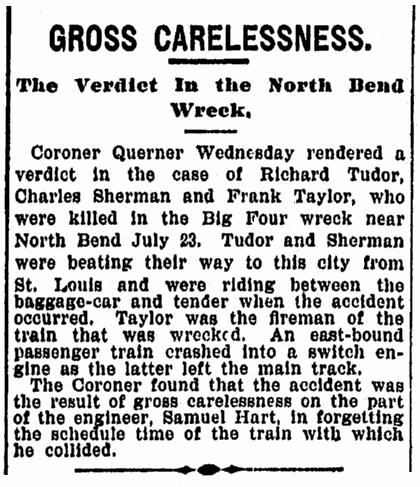 In some cases those accidents may affect more than just employees, as in this case of a railroad collision that killed an employee and two “hobos.” The morgue records list the victims of this 23 July 1894 crash as Frank Taylor, Richard Tudor, and Chas Sherman. Newspaper articles provide not only more information about the crash and those killed, but also the names of the injured. This accident involved two trains. Blame is squarely placed on the shoulders of the freight train engineer, who forgot about the express train until it was too late to avoid a collision. Two employees on the express train jumped, along with a small boy who saw them jump, saving their lives. But unfortunately not everyone had time to make that decision. Ed Bradley, presumably an acquaintance of the two “hobos,” identified the men at the morgue. The newspaper article does not provide much information about one of the men, 20-year-old Richard Tudor, except for his street address and that he lived with his mother, a Mrs. Bailes. Details given about the other man, Charles Sherman, include where he worked, previous occupations, and his fatal return after a visit with a young lady, Maud Carson. Accidents can result in numerous newspaper articles that report on the accident for days after including inquiries and of course obituaries. Any time an ancestor is a victim of an accident, occupational or personal, look for newspaper articles and be sure to extend your search to months – even a year – afterward. The limited information I found in the Hamilton County Morgue records was greatly enhanced by additional newspaper research. I was able to learn more about their deaths, the names of family members and acquaintances, as well as details that could lead to other records. Don’t limit your newspaper research to just finding one article about an ancestor. Expand your search by following up on records that mention your ancestor to find additional newspaper articles. Records that document your ancestors’ lives usually lead to other records and newspaper articles. Are you attending the RootsTech Genealogy Conference? GenealogyBank is helping to sponsor the upcoming RootsTech conference in Salt Lake City, Utah, 3-6 February, 2016. If you’re attending, come visit us at booth #523 to discuss genealogy in general, or any specific questions you have about your own family history research. Thank you, Gena! As I tell my genealogy patrons, the value of newspapers in genealogical research simply cannot be overstated. I can’t wait to see more and more of them online. Thank you for your kind comments. I agree with you 100%. Newspapers provide us with genealogically relevant information not found anywhere else. I love that we have access to so many digitized newspapers and look forward to more in the future.